Taking potshots at the BJP, Jyotiraditya Scindia said the Congress's manifesto was not like the saffron outfit's "jumla patra" (document of rhetoric) as the party would honour every promise made in the document. Kamal Nath, Jyotiraditya Scindia, Digvijay Singh and other leaders attend release of manifesto. The Congress today promised to write off farm loans of up to Rs 2 lakh and provide a "salary grant" for five years to industries offering jobs to the youth if elected to power in Madhya Pradesh. Releasing its manifesto for the November 28 Assembly polls, the main opposition party also promised a slew of benefits for other sections of the society in the state where it is making a renewed bid to dislodge the Bharatiya Janata Party (BJP) from power. Aggressively wooing farmers, who had launched a statewide protest last year, the party promised a social security pension to them and a rebate in the registration fee of land documents, besides a financial help of Rs 51,000 for the marriage of daughters of small cultivators. In its manifesto titled "Vachan Patra" (document of promises), the Rahul Gandhi-led party, out of power in Madhya Pradesh since 2003, also promised a minimum support price (MSP) for crops in accordance with the Swaminathan Commission's recommendations. 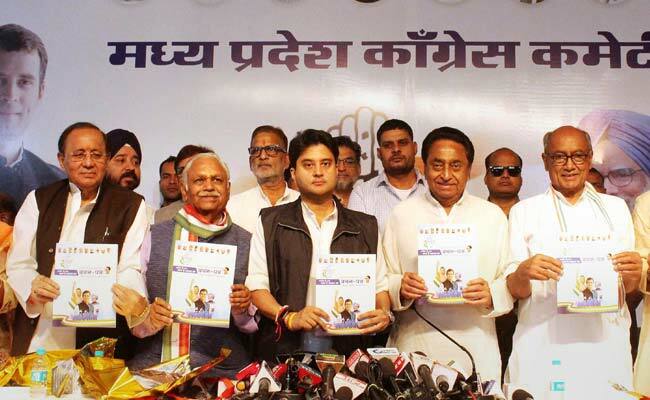 Releasing the 112-page manifesto at a press meet, state Congress chief Kamal Nath described it as the "voice of the people of Madhya Pradesh", saying the document was prepared after consultations with every section of the society. The manifesto offers sops to every section of the society, including government employees, homemakers, the common people, women and journalists, but the focus is largely on farmers and young people. Among the plethora of measures for farmers mentioned in the document, the Congress has promised a social security pension of Rs 1,000 per month to farmers who attain the age of 60 and whose land holding is below 2.5 acres, besides writing off farm loans of up to Rs 2 lakh. Other sops promised to farmers include a 50-per cent subsidy on loans for agriculture equipment, halving the power bill rates for them, a bonus on the MSP of some crops and a subsidy of Rs 5 per litre on milk procurement among others. The opposition party also promised a re-investigation into the Mandsaur police firing incident, in which six farmers were killed in June, 2017. It also promised a rebate in diesel and petrol prices. Professionals like tourist guides and lawyers would be provided an "encouragement fee" of Rs 4,000 per month for five years for settling down in their respective professions. The Congress also promised a "salary grant" of Rs 10,000 per job to the industries offering employment to the youth of the state. It promised the constitution of a Yuva Aayog (Commission for the Youth) to look into the problems of young men and women. The Congress also promised several sops, including a rebate in the Goods and Services Tax (GST) and subsidised loans for setting up industries with an investment of at least Rs 100 crore. Those covered under the existing social security pension scheme would get Rs 1,000 per month, instead of Rs 300 now, if the Congress was elected to power in the state, according to the document. A subsidy of Rs 100 on gas cylinders to poor families and free education to girls up to the post-graduation level were also promised by the party. In a bid to appease the agitating general category people, the opposition party promised the constitution of a Samanya Varg Ayog (General Category Commission) to look into their issues. The state recently saw a series of protests by people from the unreserved (general) category communities. Besides, the Congress promised regularisation of daily wagers, 30 per cent government contracts to tribals, setting up of a Senior Citizen Board, a law to protect journalists and lawyers, honorarium to journalists above 60 years of age, tele-medicine facility in rural areas and four new medical colleges. Mr Nath said a Jan Aayog (People's Commission) would be constituted for investigations into scams like Vyapam. A "jan jababdeh kanoon (public accountability law) would be enacted to hold the government departments responsible for providing public amenities, he added. The manifesto has 973 points on 50 subjects. State Congress Campaign Committee chief Jyotiraditya Scindia and former chief minister Digvijay Singh were also present at the press meet. Taking potshots at the BJP, Mr Scindia said the Congress's manifesto was not like the saffron outfit's "jumla patra" (document of rhetoric) as the party would honour every promise made in the document. "We are bringing a vachan patra and not a jumla patra like the BJP. Our document of promises has something for everybody," the former Union minister said.